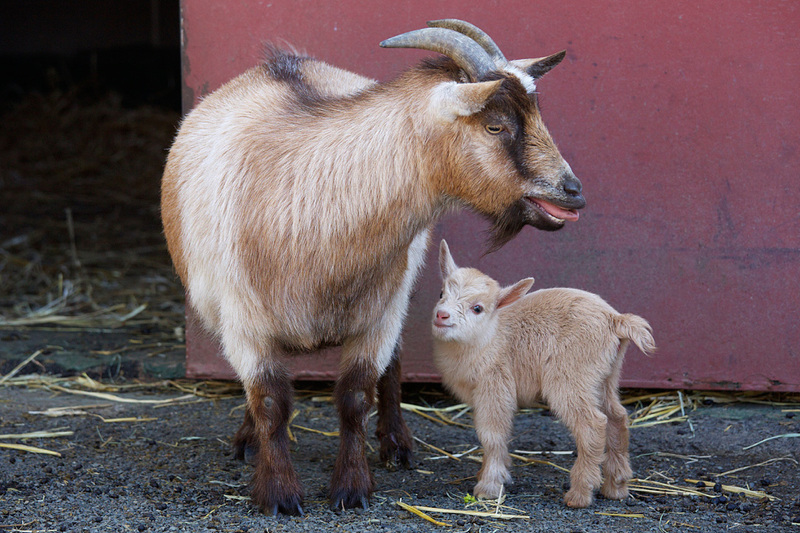 Adult African pygmy goats are about 18-21 inches tall and weigh about 44-60 pounds. Their hair is short and smooth and can be gray, black, white or any combination of the three. Both sexes have horns. The females’ horns are usually short and straight, and the males can have scimitar-shaped or spiraling horns. Our goats might look fat, but that shape is normal for this breed. Originally African grasslands and semi-desert areas, but now are domesticated and live mostly on farms. 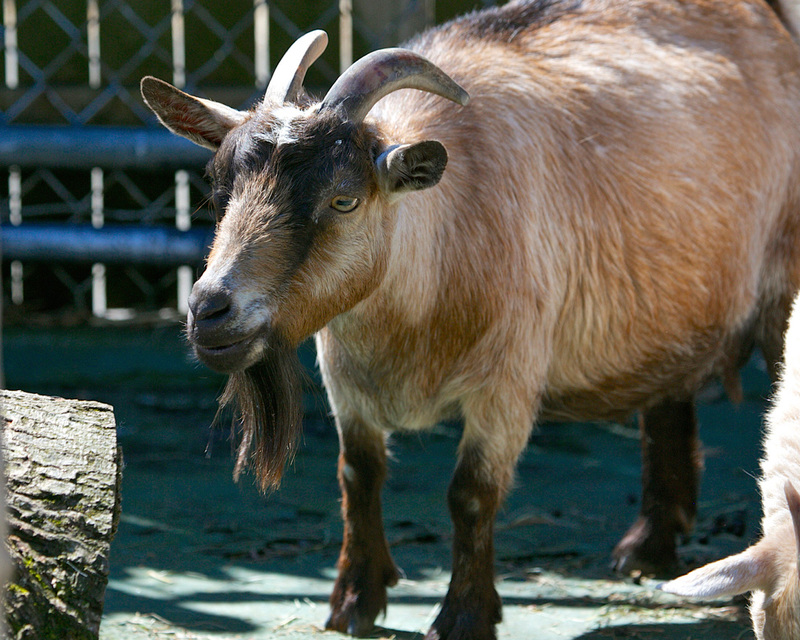 Goats are ruminants, meaning they eat hay, grasses and other vegetation. The normal lifespan is 8-12 years, but they can live up to 22 years in captivity. A typical litter is two kids born after a gestation of 21-23 weeks. The kids are born with hair and can run and jump after a few hours. Goats are social and are usually good natured and friendly. Not listed. They have become very popular amongst breeders, and have even become a popular pet. These domesticated goats originally came from West Africa. They are raised for both milk and meat. Their hides also can be used to make fine leather. Goats are very hardy animals and can exist were other domestic animals cannot. They are very agile jumpers and climbers and can be seen climbing up and down the structure in their exhibit here at the Zoo. Goats eat plants and they often eat plants that other herbivores will avoid. They even eat poison ivy. There is much folklore attached to goats. In the past, sailors believed that hanging goatskin on the main mast would bring calm seas. The goat has many meanings in Greek and Roman folklore. For example, Aphrodite rode around on a goat, and it was sacred to her.